My best friend and neighbor Growin’ Up in Maine lived less than a block away just around the corner on Church Street in Derby, Maine. What did homemade apple pie and snowmobiles have in common in 1960? His Mom made an awesome homemade apple pie, and his Dad built one of the first snowmobiles in our neck of the woods in their garage. 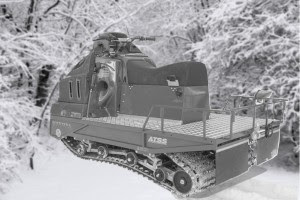 Built from scratch, that homemade monster snowmobile was an engineering marvel! The photo here is similar and huge, yet modern and factory built. I prefer that homemade version. The numerous tote roads and trails throughout Maine growing up in the 1950’s were highways to adventure during all four seasons. In winter you never saw folks zooming along through the backwoods on snowmobiles. Were they illegal in Maine? No. It’s because snowmobiles were not invented until later after suitable light duty engines were developed. Oldtimers will likely remember the Bombardier Ski-Doo, the earliest and best known snowmobile brand that was first sold in 1959. The homemade snowmobile being built next door was unlike those dual front ski and rear drive single track snowmobiles popular today. My neighbor’s prototype was a dual track front drive with a rear bench on skis for the driver and passengers. Envision a normal power lawnmower with the engine mounted on wheels and a standard u-shaped handle with motor controls at your fingertips. Now picture that lawnmower 5 times that size with a car engine and dual tracks like a tank instead of wheels, yet with that same handle only really heavy duty. The custom bench on 4 skis was towed behind the engine contraption and attached to rotate like a trailer hitch. The bench was long enough for several passengers to straddle the width with the driver up front and in control. I don’t recall if the homemade snowmobile was built in a single season, or if it took two. My best friend’s Dad was very ingenious because he did not have the luxury of store bought parts, so hand crafted many of the components in his design. Most memorable were several versions of the slats on the tracks made by hand and destroyed on test drives until a working solution was discovered. Being witness to those experiments and delightful destruction as the huge monster was cranked up and put into gear was matched only by the day it finally worked! Did it really really work? YES. What an amazing sight seeing that homemade monster snowmobile plowing through the snow and anything or everything that got in its way on the fields between Church Street and the railroad tracks! Who was this legend of Derby? I usually don’t name names in my stories, yet here’s a clue. If you know the history of Derby and Milo, years later he was the contest winner who wrote the slogan “Milo, a Friendly Town”. Until the horrific Main Street fire in 2008, that slogan was seen on the True Value Hardware storefront as you entered town on Route 16.